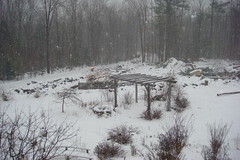 The snow started today around noon, and it’s now almost eight, and it hasn’t stopped nor slowed down. I bet you we have close to a foot, at least, even though the forecasts kept saying that the storm was going to mostly stay south of us. There’s a Nor’easter planned for this weekend, too, where they are saying we could get two feet. Yikes. It feels early for this much snow. 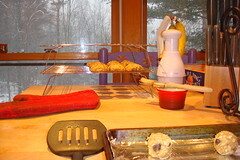 I spent the day baking and listening to carols, which seemed the perfect thing to do while a snow storm rages. We’ve got fresh bread again, and four dozen oatmeal chocolate chip toasted almond cookies now. Frank was complaining last night (in jest) that we don’t have any crap food around for late night snacks, and he’s right, but now we do! Although really, they aren’t good for you, but they also aren’t full of high fructose corn syrup and 27 preservatives, either. 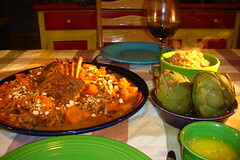 I also developed and tested a new-to-me lamb recipe — Moroccan-style Braised Lamb Shoulder Roast. I wanted something without mint — been there, done that. I also didn’t want to de-bone the shoulder roast, which is a pain in the neck. I really like the way this came out. It’s a little sweet with the apricots and raisins, but a little spicy with the jalapeño. The lamb was really tender and tasty, and I think using our own canned tomatoes and lamb stock just make it very special. I served it with artichokes and red quinoa, which soaked up the sauce perfectly. I’d never eaten quinoa before, and I will definitely do it again. Yummy. The chickie drama today was just something else. The mamas all had their babies out, even after the snow started. There was much squawking, bringing me out a couple of times to be sure all was still okay. Then we we did evening chores, which happens at about 3:30 these days, all of babies were still outside, with no mamas in sight. Uh, problem. 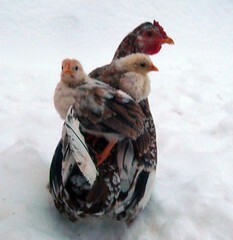 After chasing chicks from under the pig palace for far too long in a heavy snow storm, I kept bringing the mamas out and putting them near the babies. Slowly, slowly, they’d get another one in, until finally, we were down to just these two, who absolutely refused to step in the snow. So they took a ride instead! Too cute. This entry was posted in Chickens, Food, Snow. Bookmark the permalink. Post a comment or leave a trackback: Trackback URL.